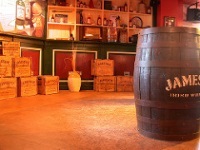 The Old Jameson Distillery is located in the heart of Dublin. Visiting is a treat for whiskey lovers, and there's a taste of Irish culture and history thrown into the bargain. This museum illustrates the history of Irish whiskey, known in Irish as uisce beatha (the water of life). The expert guides will answer any questions whiskey lovers might have. The tour takes visitors through the triple distillation process that sets Jameson apart. In the beginning there is a film explaining the 'Angel's Share', which is very interesting. A free glass of Jameson Whiskey is included in the tour and visitors can choose to partake in a whiskey tasting in the bar after their tour and sample different Irish, Scotch and American whiskeys. Transport: Both the Dublin Bus and the Sightseeing Hop On Hop Off bus stop at Smithfield (Stop 20). From there, it's a short walk up Church Street and left on to May Lane/Bow Street. Opening times: Open daily: Monday to Saturday 9am-7pm, Sunday 10am-6pm (last tour at 5:15pm). Closed Good Friday and Christmas holidays. Admission: Adults €14, Children under 18 €7.70. Concessions available.